Hi everyone! Jill Foster here and today I’m mixing and matching three Faber-Castell Design Memory Craft® mediums to create a set of three tags. Happy Saturday and hope all is well. Tenia Nelson from Jazzy Paper Designs showing y'all some Faber-Castell goodness......CHECK IT!!!! Good morning, Faber-Castell Design Memory Craft fans! 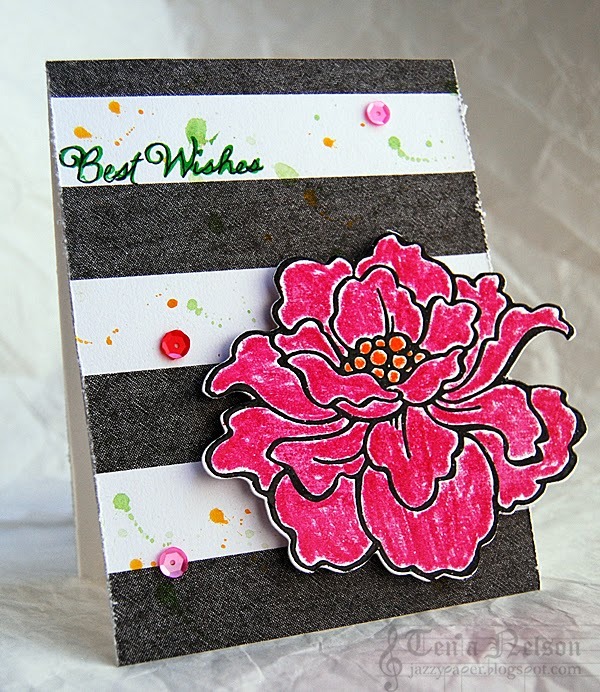 Stacey here with a fun watercolored background using Gelatos! The Faber-Castell Gelatos are so easy to use and create a fabulous artistic effect to cards and other paper-crafting projects! I colored a few coordinating gelatos on my craft mat, spritzed with water, rubbed my finger through the color a bit to blend, and placed the watercolor paper over the color for a few seconds to allow the color to be absorbed somewhat. Creating beautiful backgrounds is easy with Faber-Castell Gelatos! Hi everyone, Mieko here today to share another card using Art GRIP® Aquarelle Watercolor Pencils. MIX & MATCH makes designing with COLOR simple. I chose a yellow(#770111) color set for my card. Simply comment on any (or all!) of our Blog Hop posts from April 24-April 25. For each comment, you will be entered into a drawing to win one of two fabulous prizes: One lucky winner will receive a $75 Faber-Castell prize pack of Gesso, Glaze, Gel Medium, and 10 new Gelatos Double Scoops and one lucky winner will receive a Taylored Expressions stamp set and die of choice! Comments close Sunday, April 27 at 8pm PST. You may have noticed that it's been hard to connect to our blog for a couple of days now. Unfortunately Typepad was undergoing a DDos attack by hackers, so our connection remained spotty for a while. "Though Typepad has not yet publicly shared much information about its attackers, the typical scenario involves an attacker knocking the victim’s site offline using a flood of traffic, then refusing to stop the barrage until the victim company pays a small amount of “ransom.” The initial amount is usually fairly insignificant, but once the victim agrees, it tends to go up, as they’ve now confirmed themselves as an easy mark." It appears fixed (for now), but hopefully things will be back up and running soon. We apologize to everyone for any inconvenience this has caused! Faber-Castell Design Memory Craft is looking for talented designers for our Guest Design Team (June 2014-September 2014). We are looking for talented designers to help promote our brand for design, memory and papercraft applications from June 2014-September 2014. The successful applicant will need to work well with deadlines and consistently produce projects of high standard. Please send us the following information by May 9, 2pm EST via email to naoko@fabercastell.com with ‘Design Team Application’ in the subject line. 1 project with step by step directions. *please note- your personality is important to us. Show us who you are! You can also use videos or old posts here. Finally…like/follow us on Facebook, Pinterest, and Twitter! The Guest Design Team will be announced on May 15, 2014. Jen here with another peek into my Sketchbook Project journal! I wanted to show you the inside front page today. I wanted to see some journaling through the window in the front cover. I decided to journal in a "circle" since that was the overarching theme of my journal (I have a love of circles...).